a city rich in circus history. 3-Ring News, organized a group of people to learn the basics of clowning for the city celebration of the P.T. Barnum Circus Centennial. Shortly after that celebration in April of 1971, Cousin Otto's Alley # 22, the first official clown alley in Wisconsin, was born. In conjunction with that celebration, Delavan was chosen as the place where the first Circus stamp was issued by the U.S. Post Office. Delavan is also the original home of the Clown Hall of Fame. Within the next two years, Cousin Otto's Clown Alley joined the COA (Clowns of America), now COAI, (Clowns of America International). We were on the ground floor for the beginning of the Midwest Clown Association (MCA) and World Clown Association (WCA). The Alley has a lifetime membership with COA. The number 22 in the alley name signifies that Cousin Otto's was the 22nd alley to become a member of COA. We celebrated our 41st anniversary this April. We hosted the third COA annual convention in Delavan, the first one to be held outside of the COA headquarters in Baltimore, Maryland; and have since hosted many conventions and Round-Ups. and several Clown Hall of Famers. Herb “Happy Herbie” Moering and Darlene “Sudsy/Molly Putz” Malkow. Cousin Otto’s currently meets the first Tuesday of every month at a community center in Delavan. We are a non-profit organization. We have a current membership of about forty individuals, whose ages range from age nineteen to one hundred years old. Our members are from eighteen different communities in the Wisconsin/Illinois area. We participate as a group in parades, which includes the Great Circus Parade in Milwaukee; fundraisers (such as stage shows for Make a Wish Foundation), conventions, at hospitals, churches and community events. Thanks to Gordon Yadon, a local circus historian, we are fortunate to perform center ring in any circus stopping through Delavan. This last year, we began an Alley Renewal Program to address our aging alley and dwindling membership, focusing on our strengths and weaknesses and making plans to rejuvenate the alley. Our focus is on increasing membership and erasing the negative perception of clowns in the community. Come join the fun and "clown around" with us! 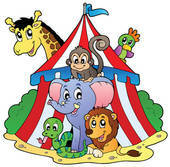 Click on the Circus picture on the left to check out our meeting/membership page for more details.